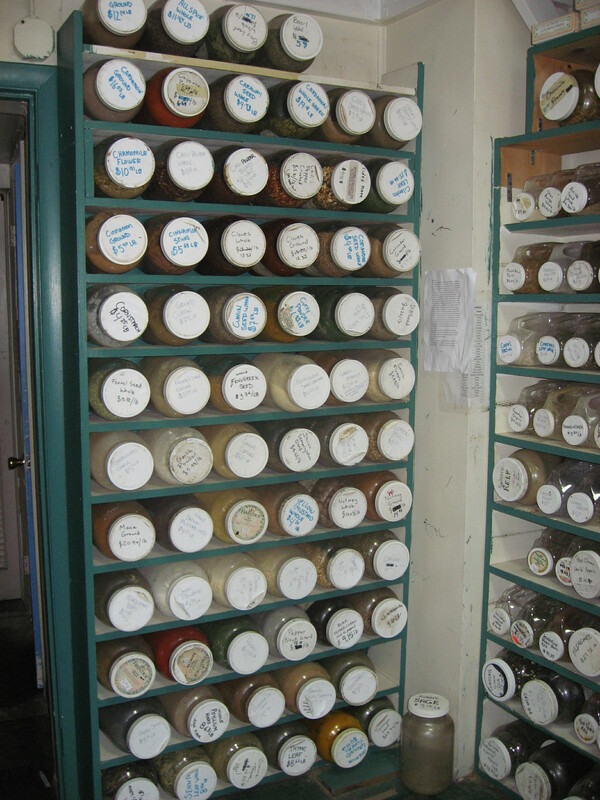 Like other bulk sections in Glut, the Bulk Herb and Spices room is a treasure you’ll want to find! Whether you are looking for medicinal herbs to make teas or tinctures, cheap bulk organic green tea, or simply need to refill your spice jars, this section will blow your mind (but not your wallet!). The jars are kept in alphabetical order, but please ask for assistance if there is something you can’t find, they easily get out of order! Typically, the items on the shelf to the left are Culinary herbs, and the shelf to the right is Medicinal Herbs, of course there is some overlap, but this is a general rule of thumb to keep in mind as you look for what you need. As with other bulk sections, please write the price per pound on your bag (it’s on the top of the each jar), to make check out go faster. The price per pound may look big, but remember, dried spices tend to be very very light! Did you know that the room where we keep the bulk herbs used to be a Barber Shop? For other Glut fun tidbits, visit our History page! Below is a list of all the bulk herbs we typically carry. Please keep in mind not every item listed is available at all times (it often depends on our venders availability). We do our best to keep each item in stock, but please be patient if we have trouble getting a specific item in. If you want to confirm that something is in stock, please call the store during regular business hours. List last updated on 11.25.2012.